LPRS (Low Power Radio Solutions), worldwide radio specialists supplying robust wireless solutions where reliability is paramount, has been appointed by Link Labs to sell its market leading LoRa™ range of wireless modules and gateways. 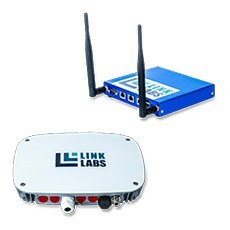 Based outside Washington D.C., U.S.A., Link Labs has developed novel methods for communicating with multiple wireless devices at long range, and with low power consumption using the LoRa™ networking protocol LoRaWAN. This technology offers the ability to connect hundreds or even thousands of sensors and actuators over a wide area to a single gateway, thus providing a complete solution for end users to get their IoT (Internet of Things) products to market quickly. “LPRS have almost 30 years’ experience of delivering wireless communication solutions to our customers,” states Nick Pummell, Managing Director of LPRS. “We are excited to announce that our first major distribution agreement in Europe is with LPRS. They have the deep wireless systems knowledge and integration capabilities as well as world class service capabilities that our customers in Europe need,” said VP of Business Development and Marketing, Bryan M. Eagle III. LPRS designs and manufactures the highly successful eRIC and easyRadio Advanced (eRA) wireless modules in the UK. LPRS product range now includes: Raspberry Pi and Arduino Shield wireless platforms, antennas, a wide range of sensor products, Circuit Design wireless products and the IQRF range of wireless mesh networking components for telemetry, industrial control and building automation.